Our contemporary style Amish Artesa Three Piece Entertainment Center Wall Unit with Bookcase features gentle arch designs throughout and boldly tapered legs. Consisting of a large center unit available in three widths, and two bookcases on either side, this piece makes a statement. Standard features of this entertainment center is a smoked glass center door with arching mullion design and two inset panel wood doors with soft close hinges. One adjustable shelf sits behind each wood door. Behind the glass doors in the bookcases sit three adjustable shelves. Each side cabinet has a cord hole. Shown in rustic cherry with Michael's cherry stain, this media wall unit can be custom made in a variety of wood and stain options. Don't need the bookcases? 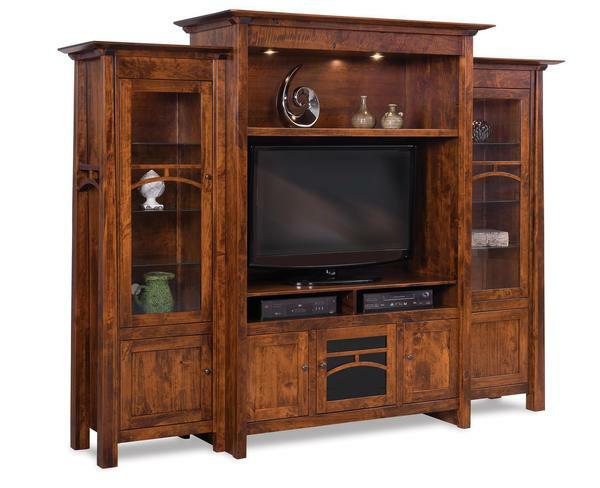 Check out our Amish Artesa Entertainment Center. Shown in Rustic Cherry with Michaels cherry.